This tutorial contains instructions on how you can backup and restore your Chrome Bookmarks. 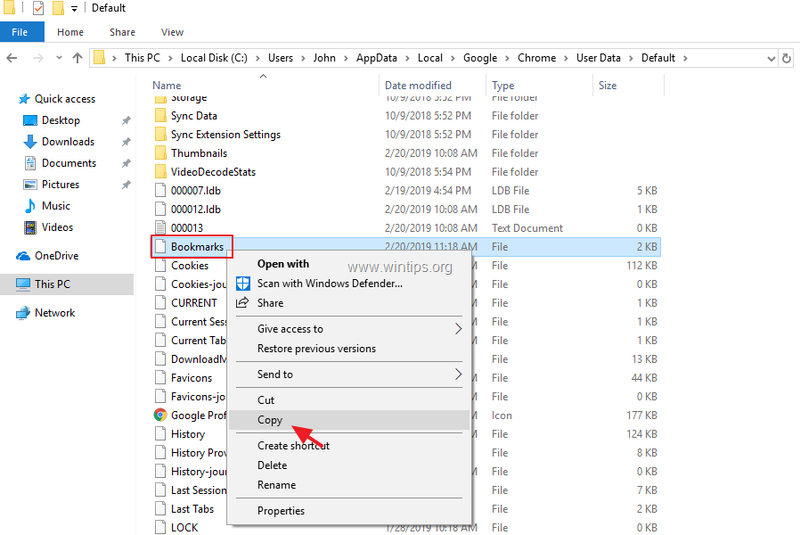 Importing and exporting your bookmarks from Google chrome is a necessary operation if you want to manually transfer your bookmarks in your alternate personal computer or if your profile was corrupted. Keep in mind that if you already register for a Google account and you use Chrome as your Internet browser you can use the Chrome's sign-in feature to synchronize your bookmarks, extensions, apps, theme, and other browser preferences with your Google account. By using Chrome's Sign-In feature, your settings are always available from every computer or device after Sign-In with the Google account in Google Chrome. How to Backup Google Chrome Bookmarks. Method 1: Backup & Restore Chrome Bookmarks file Manually. Method 2: Export/Import Chrome Bookmarks To/From an HTML file. Method 1: Backup/Restore Chrome Bookmarks Manually. The easiest way to backup and restore the Chrome bookmarks, is to copy and paste the 'Bookmarks' file, from (to) the Chrome profile folder. * Note: You must enable the hidden files view to be able to view the contents of this location. How to Backup Chrome Bookmarks Manually. 1. Close the Chrome browser. 2. Enable the Hidden files view. 3. Explore the contents of the default folder, and then Copy & Paste the Bookmarks file to your backup location. (e.g. your external USB disk). How to Restore Chrome Bookmarks Manually. 4. Launch Chrome and you 're done! Method 2: Export & Import Chrome Bookmarks HTML file. 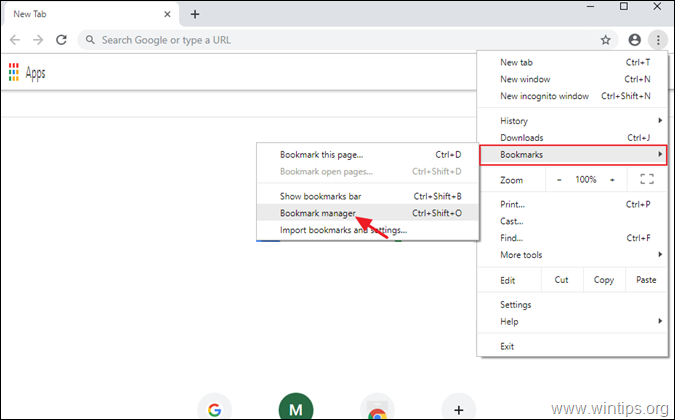 The second way to backup your Chrome bookmarks is to export them to an HTML file and then to import the exported Bookmarks.HTML file to Chrome, by using the 'Export/Import to HTML' feature from Google Chrome's menu. How to Export Chrome Bookmarks to an HTML file. 1. Open Google Chrome and from the Chrome's menu choose Bookmarks -> Bookmark manager. 2. Then click again at (2nd) three (3) dots menu at the top right, and select Export bookmarks. 3. Type a name (if you want) for the exported Bookmarks file and Save the HTML file to your backup destination. How to Import Chrome Bookmarks from an HTML file. 2. Then click again at bookmark's manager menu at the top right, and select Import bookmarks. 3. Select the bookmarks HTML file from the backup, and click Open. « How to find & manage Windows 10 Update options. » How to Disable Windows 10 Upgrade and Remove the "Get Windows 10" update notification icon. My preference is for IE as the urls are just ordinary files that can be copied and moved with any file explorer. The Bookmarks file is an HTML file that contains every bookmark, so making it difficult to edit, if it were viable. I have around 11,000 urls and I often move them around with file explorer. Plus I can back them up to my NAS automatically so they are available on any PC I use both on my company PC as well as my own ones. I am becoming disillusioned with using Chrome, Epic and other similar browsers. Why in the hell does Google make it so difficult to get to bookmarks. When I went to make a bookmark or go to a bookmark, I don't want to hunt all over for it. CM browser takes 3 seconds to make a bookmark, 15 seconds to pull them up. Rediculous. this does not work if chrome does not open(one of the problems you specify in the preceding page) I am using IE to get access to the web because chrome will not load, therefor I cannot access the chrome bookmarks to save them. @RAY: Follow the steps on method 1 to backup your bookmarks and then Completely Uninstall and Re-install Google Chrome.